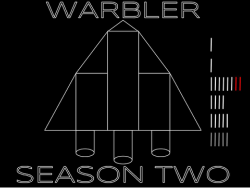 Click here for an exclusive look at the technical and artistic processes behind Warbler! ﻿﻿﻿﻿﻿﻿﻿Welcome to the Homepage for Warbler, a Serialized Novel. The current update schedule involves updates each Monday, all Episodes the first Season are available, as well as the first five Episodes of the second Season, and backstories for all major characters. To receive notifications of new episodes, please sign up for the email list below. Warbler is self-rated PG for relatively frequent but mild use of language.